Introducing.... THE GLUE SPONGE! -- This has revolutionized collage in my classes - LOVE IT!! Wish I could take credit for this great idea for your next cut and paste project! 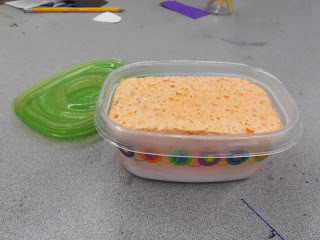 Cut a new sponge to fit a plastic container (use two sponges if you only have thin sponges), and pour a bottle of school/white glue all over it. It can take quite a bit of glue to load it up, but once the sponge is saturated with glue, it will last a long time! Now kids can just tap their shapes and cut-outs on the top of the sponge for a thin, even coat of glue - no more puddles! I was concerned about the sponge getting icky, but she says she still has the one she made well over a year ago, and the sponge is still intact AND the glue isn't stinky. To maintain: Add a few spritzes of water before closing it up for the day, and flip the sponge over every so often.